18 Hereford is located on the east side of Hereford, between Beacon and Marlborough, with 16 Hereford to the north and 20 Hereford to the south. 18 Hereford was built ca. 1871 for builder and contractor George Martin Gibson, one of four contiguous houses (14-16-18-20 Hereford) built for speculative sale. Click here for an index to the deeds for 18 Hereford. On November 1, 1871, 18 Hereford was purchased from Frances Gibson by Lucy Elizabeth (Lewis) Harris, the wife of Amos Holbrook Harris, a wholesale druggist. They previously had lived at 7 Pelham. They continued to live at 18 Hereford during the 1877-1878 winter season, but moved thereafter to 141 Pembroke. Lucy Harris continued to own 18 Hereford and lease it to others. By the 1878-1879 winter season, 18 Hereford was the home of Josiah W. Chamberlin and his wife, Linda A. (Bigelow) Chamberlin. They previously had lived in Dorchester. He was a cotton and wool commission merchant and treasurer of the Marland Mills in Andover. Josiah Chamberlin died in October of 1882. Linda Chamberlin continued to live at 18 Hereford during the 1885-1886 winter season, but moved thereafter to 64 Huntington. On September 15, 1886, 18 Hereford was purchased from Lucy Harris by the estate of Rev. Rufus Ellis, former pastor of the First Church in Boston, who had died in September of 1885. It became the home of his widow, Gertrude Louisa (Blake) Ellis, and their unmarried son and daughter, Arthur Blake Ellis and Gertrude Stanton Ellis. They previously had lived at 106 Marlborough. Gertrude Louisa Ellis died in February of 1895 and, under the terms of Rufus Ellis’s will, 18 Hereford became the property of their five children: William Rogers Ellis, Edward Clarke Ellis, Gertrude Stanton Ellis, Arthur Blake Ellis, and Rufus Ellis, Jr.
On March 4, 1895, William Ellis, Edward Ellis, and Rufus Ellis transferred their interests in 18 Hereford to Gertrude Ellis and Arthur Ellis. A lawyer by training, Arthur Ellis had practiced law until about 1889, when he became a trustee. In 1895, he entered Harvard Divinity School, graduating in 1898. He was ordained as a minister in 1899. He and his sister, Gertrude, continued to live at 18 Hereford during the 1897-1898 winter season, after which he moved to Burley, Washington, and she moved to 10 St. Botolph. On June 22, 1898, 18 Hereford was purchased from Gertrude Ellis and Arthur Ellis by Louise Gray (Fraser) Craigin, the wife of Dr. George Arthur Craigin. He was a physician and also maintained his medical office at the house. They previously had lived (and he had maintained his office) at 405 Marlborough. They continued to live at 18 Hereford during the 1919-1920 winter season, but moved thereafter to 374 Marlborough. On July 9, 1920, 18 Hereford was purchased from Louise Craigin by Mabel (Kates) Morrison Scott, the wife of attorney Arnold Scott. They also maintained a home in Dedham, where they had lived earlier in 1920. 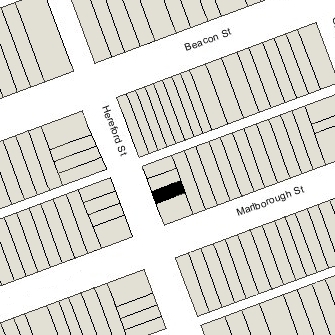 During the 1918-1919 season, they had lived at 297 Marlborough. 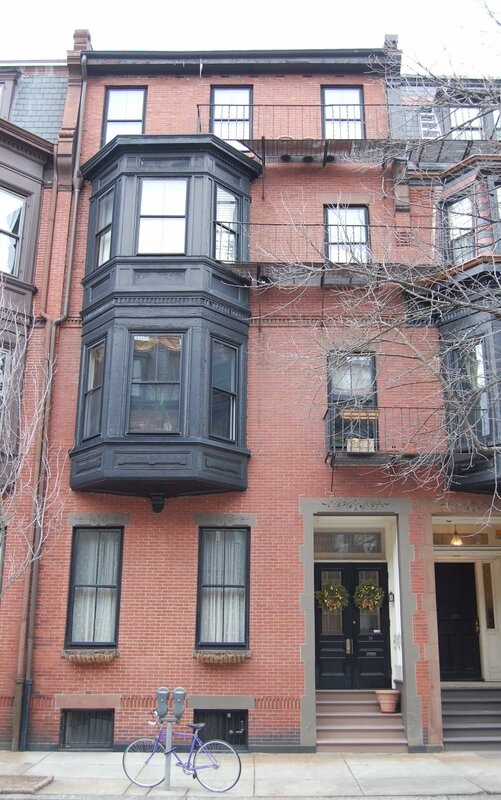 In July of 1925, they purchased and subsequently moved to 406 Beacon. Mabel Scott continued to own 18 Hereford and lease it to others. During the 1925-1926 winter season. 18 Hereford was the home of Russell Burrage and his wife, Katharine Lee (Baxter) Burrage. They also maintained a home in Beverly Farms. Russell Burrage was a manufacturer of ammunition casings and later treasurer of a dredging company. They had moved to 197 Beacon by the next season. By the 1926-1927 winter season, 18 Hereford was the home of Francis George Shaw and his wife, Marguerite (Hofer) Shaw. They previously had lived in Cambridge. Francis Shaw was affiliated with International Harvester Company and then with a road machinery company. At the time of the 1930 US Census, he listed his employment as “Club President.” Marguerite Shaw operated a dress shop at 36 Newbury. They continued to live at 18 Hereford in 1930, but had moved to 5 West Hill Place by 1931. 18 Hereford was not listed in the 1931-1937 Blue Books and was shown as vacant in the 1931-1938 City Directories. On July 28, 1937, 18 Hereford was acquired back from Mabel Scott by Louise Craigin. By that time, George and Louise Cragin were residents of Swampscott. On September 14, 1937, 16 Hereford was acquired by Bernetta V. Coombs, the widow of Marshall F. Coombs. 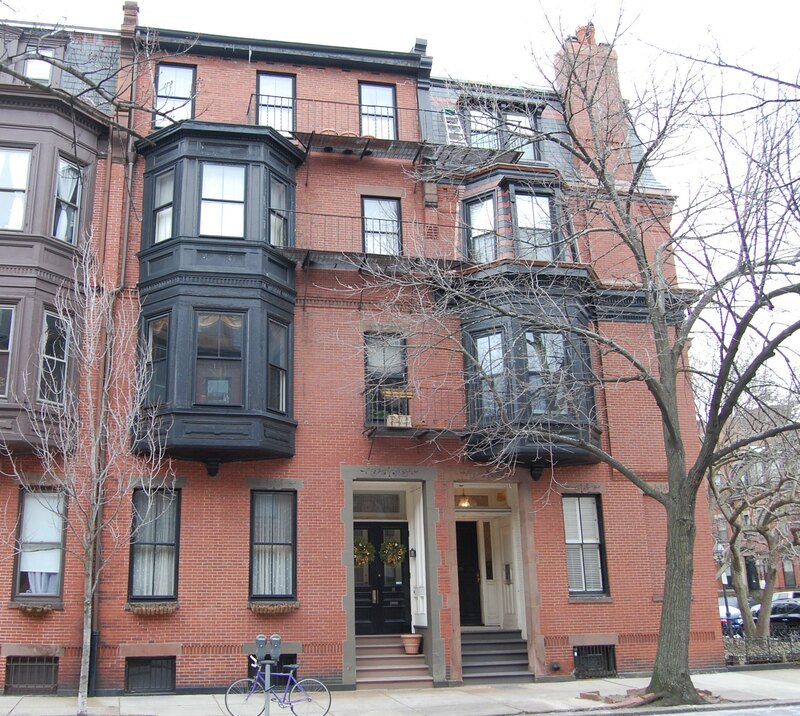 She previously had lived at 1431 Commonwealth in Allston. 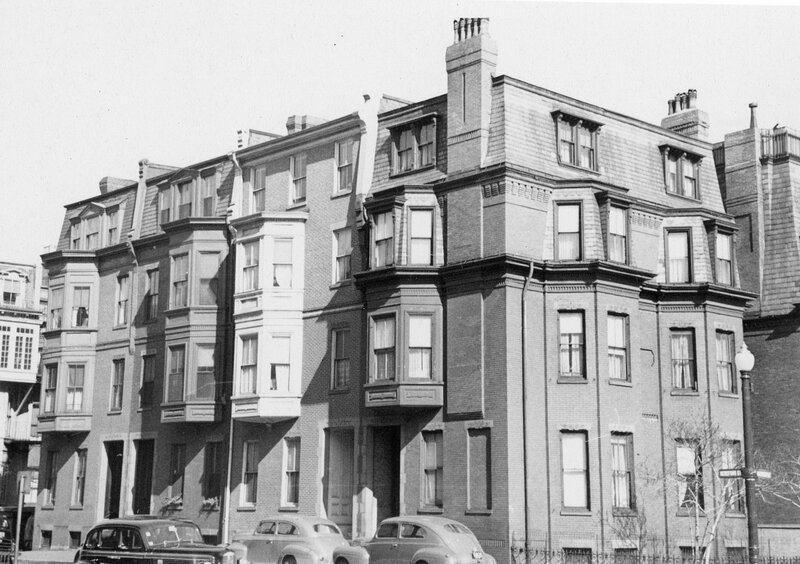 In October of 1937, she filed for (and subsequently received) permission to convert the property from a single-family dwelling into eight apartments. It appears likely that it was at this time that the top story was modified and the original mansard roof and dormers were eliminated. Although she received approval for the conversion, she apparently decided to operate the property as a lodging house instead, and in November of 1938, she applied for (and subsequently received) permission to convert the property into a lodging house. Bernetta Coombs continued to live and operate a lodging house at 18 Hereford until the mid-1950s. On June 16, 1954, 18 Hereford was acquired from Bernetta Coombs by George Edwin Dunphy. He and his wife, Eleanor Mae (Topliffe) Murphy Dunphy, lived at 404 Marlborough. The property changed hands and on August 23, 1963, was acquired by by Newbury Halls, Inc. In September of 1963, Newbury Halls, Inc., filed for (and subsequently received) permission to convert the property from a lodging house into a dormitory. It subsequently was operated as a dormitory for Chamberlayne School and Chamberlayne Junior College, located at 128 Commonwealth. On July 8, 1965, Chamberlayne acquired 18 Hereford. Chamberlayne went bankrupt in the mid-1970s and in May of 1975, 18 Hereford was purchased from Chamberlayne (as debtor-in-possession under its bankruptcy plan) by David W. Rosenberg and his wife, Deirdre Rosenberg. In January of 1976, David Rosenberg filed for (and subsequently received) permission to convert the property from a dormitory into a single-family dwelling, noting that he and his family had occupied it as such since July of 1975. The property changed hands. It remained a single-family dwelling in 2017.